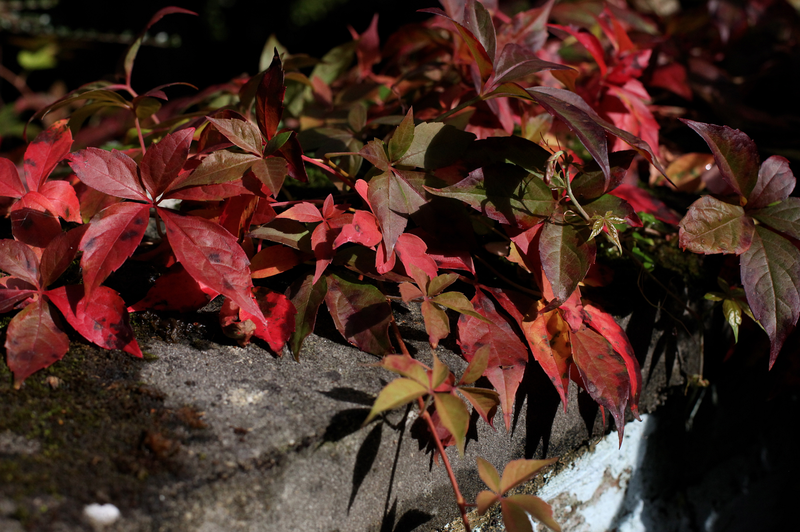 The leaves are starting to turn red in the garden, my hands keep getting cold as I cycle into town and the heating has been turned on. Autumn has arrived in Oxford, heralding the new academic year. The combination of maple syrup and nutmeg is one I've been trying to find a home for since last year, when I baked some Maple Nutmeg Biscuits. They didn't bake up particularly well but I loved the flavouring in the dough. It's warm and nutty (especially with the brown butter in this recipe), sweet but complex and balances well with some sea salt - a perfect autumn pairing. The recipe these madeleines are based on is from Heston Blumenthal - he says they were his way of treating his wife when she'd had a long day. 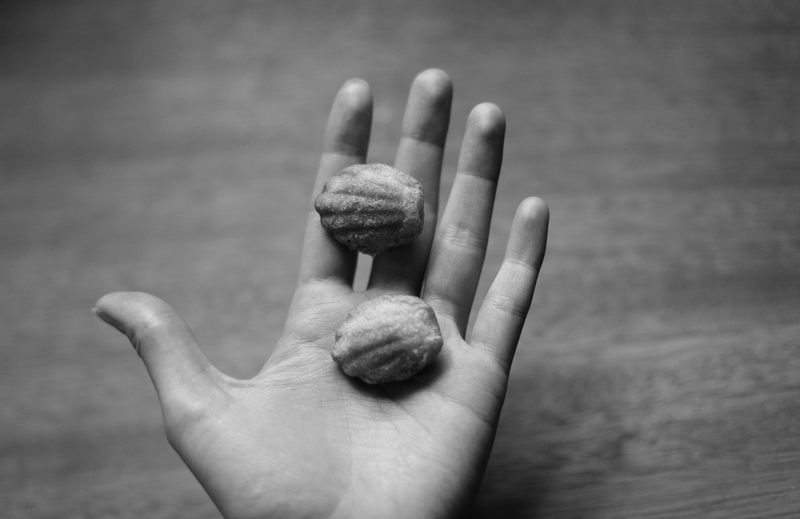 They're not typical madeleines as the mixture is more of a financier batter (like these almond ones). The first time I made his recipe was the day I handed in my extended essay in my third year. The essay - my only non-medieval paper - was on taste and memory in Joyce, Woolf, Proust and modern food memoirs, so it seemed appropriate. The traditional recipe is based on a génoise batter. I've made David Lebovitz's recipe for Lemon-Glazed Madeleines in my normal sized tin a few times and I highly recommend it. I've come to the conclusion that I like the more traditional recipes in the normal madeleine tin. 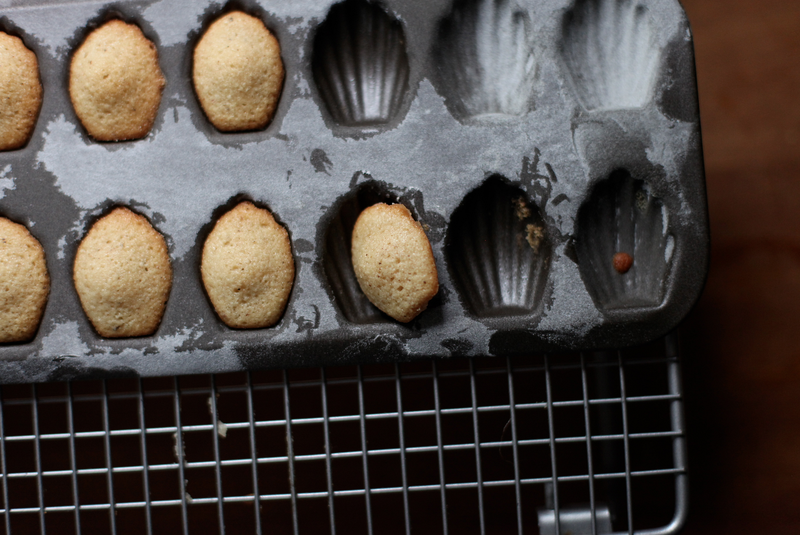 I prefer this denser recipe for mini madeleines, as you get crispy edges and a damp, flavourful middle. The traditional recipes are lighter and the cake seems almost non-existent in such small quantities. I bought my tin in France from a little kitchen shop in Dinan when we were visiting Brittany last year. It's a Gobel mini madeleine tin with the non-stick coating. The cheapest UK source I've found is here, and I also found it at Williams Sonoma (which ships to many countries beside the US). Obviously it's an expensive luxury to buy a tin with one purpose, but I thought I'd link it in for fellow baking tin enthusiasts. 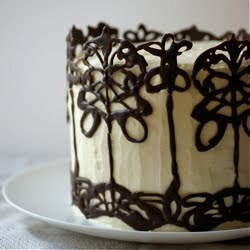 I also have a plan to butter the tin, coat it with lots of cocoa powder and pour in a ganache to set. 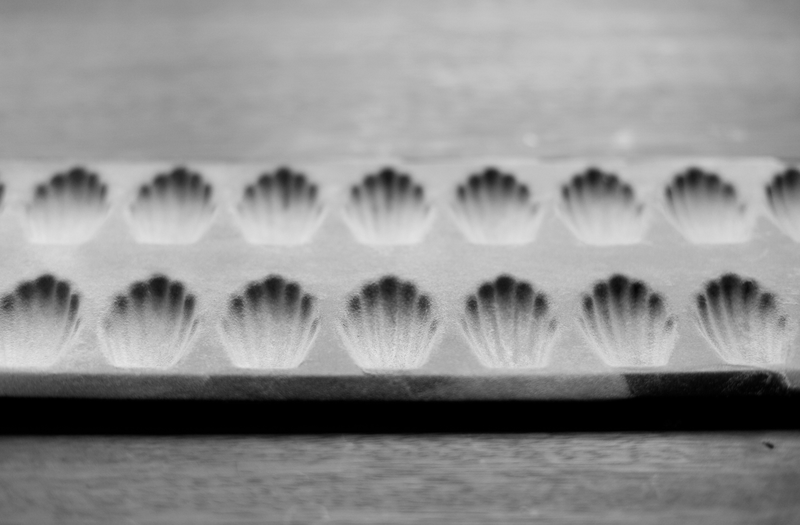 I'll let you know if I end up with pretty shell chocolates. I baked half the batter on one day and then baked the rest the next. It worked well but I wouldn't leave it for more than 24 hours. I made a half batch of my original adapted recipe, which I've put below. A little goes a long way. You can double it if you need more or you'd rather not have half an egg white lying around - I used mine in some scrambled eggs with the yolks. It is a faff but do make the effort to chill the mixture. I tasted it before and after chilling and the difference in the strength of the flavours is huge. 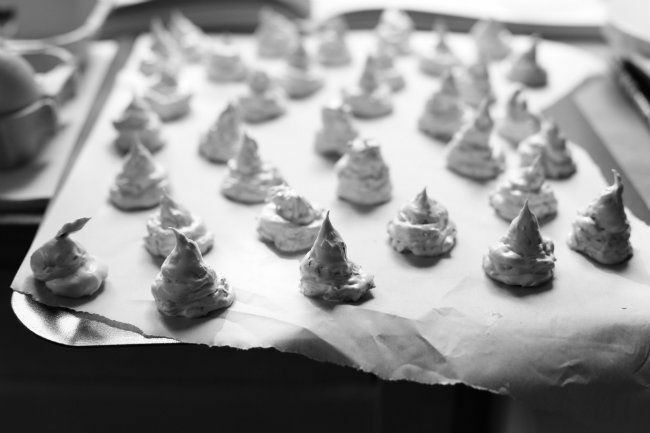 It also helps the cakes rise and produce the signature hump - it's a bit smaller in little tins, but it should still be noticeable. I took a batch of these, still hot from the oven, across the road to my friend's house. We balanced the plate on the arm of the sofa and curled up with cups of tea next to it. Sharing small things is somehow more satisfying that just having a slice of cake each. They would also be great to serve with coffee at the end of a dinner party or celebration meal. You could have the mixture chilling in the tin and then just pop it in to bake when you're ready - they only take ten minutes. Cut the butter into slices and place into a small pan. Melt then heat until the butter smells nutty and is full of light brown specks. (If you haven't browned butter before, try my Foundations post for instructions/photos/video). Pour into a bowl to cool. Sieve the icing sugar, almonds and flour into a mixing bowl. Add the egg white then whisk to combine. Finally whisk in the maple syrup, nutmeg, sea salt and warm (not hot) brown butter. Cover the bowl with cling film and chill in the fridge for at least an hour. Carefully butter the tray, making sure you get into all the ridges. Sift/scatter over some flour and tap until the butter is evenly coated with a fine dusting. 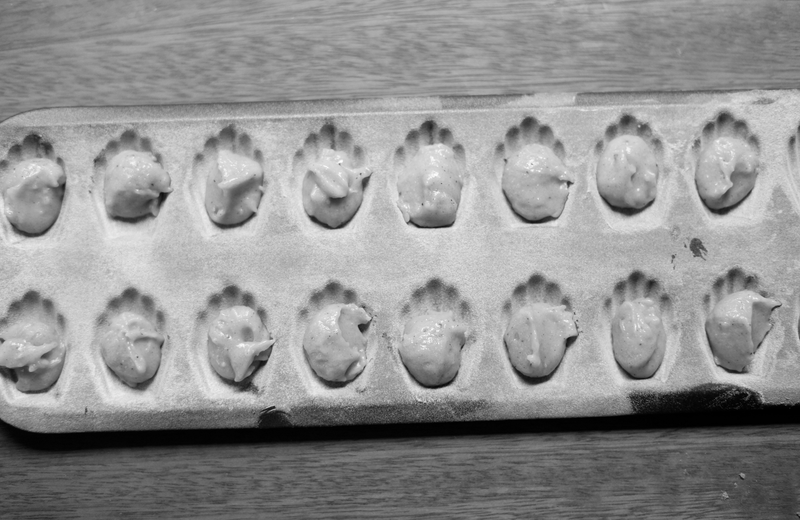 Spoon in a little of the chilled mixture - about a teaspoon - so the mould is 2/3 to 3/4 full (as in the picture above). Put back into the fridge to chill for another 15 minutes (or longer). Preheat the oven to 170C. 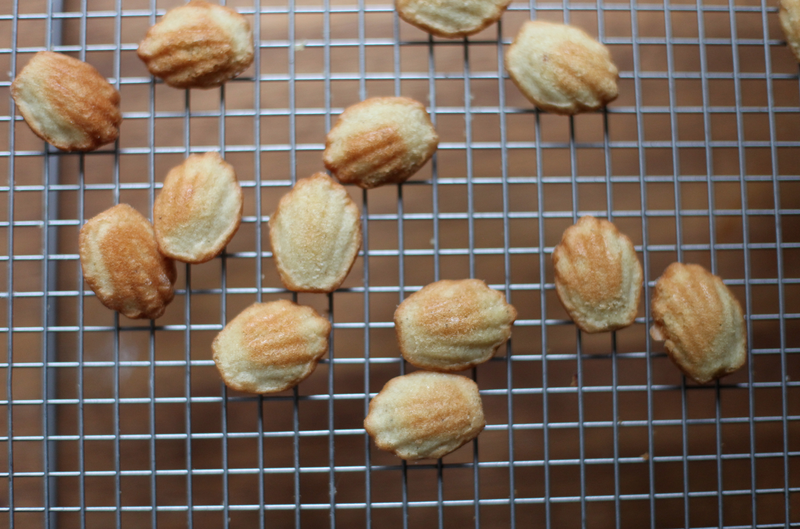 Bake the madeleines for 8-10 minutes - they should rise up with little humps in the middle and be a golden brown with slightly darker edges. Leave in the tray to cool for a minute, then ease them out of the tray (sometimes they need loosening around the edges but mostly they pop out easily). Leave to cool for five minutes then eat warm. They're best within an hour of so of baking and definitely on that day. The mixture keeps in the fridge for up to 24 hours. 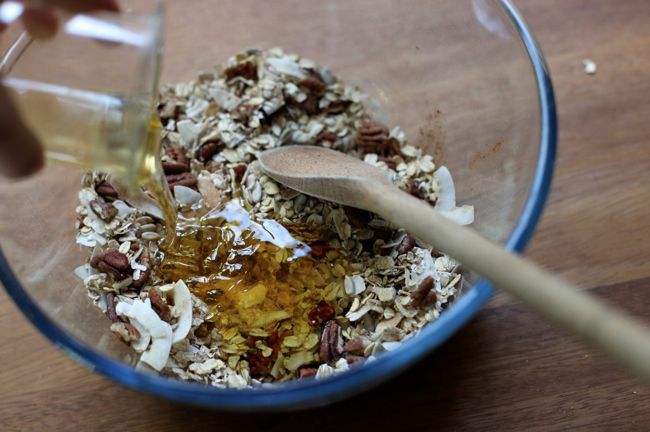 I like my granola darkly toasted and clumpy, strewn with fruit, light on seeds, heavy on pecans and salty-sweet-savoury from sea salt, honey and extra virgin olive oil. Originally I added the dried fruits at the beginning but they became too crunchy and you couldn't really detect the flavours. Now I add them near the end - just long enough for the fruits to soak up some of the liquid and meld into the mixture. For breakfast, I dollop a few spoons of greek yogurt into my bowl, add whatever fresh fruit is to hand (sliced apple or banana, berries etc), splash in some milk and then scatter a handful of the granola over the top. It's also good with straight milk, though I like the complexity some fruit and slightly sour yogurt adds. Sometimes I take a little box of it to the library, to eat outside when I'm getting some fresh air. It's my granola break - a fag break for sugar-dependent non-smokers. 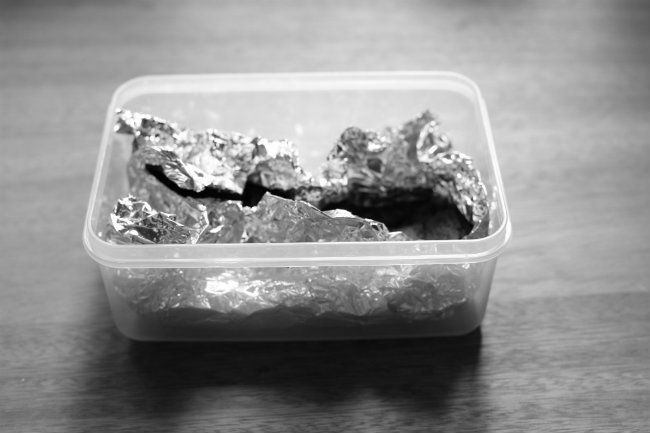 Finally, learn from my mistake: don't put it in a clear plastic box on your worktop. Whenever I'm in the kitchen I find it impossible to keep my hands from cracking the sides of the lid open and sneaking a few clumps. It taunts me every time I make a cup of tea. Preheat the oven to 150C/300F. 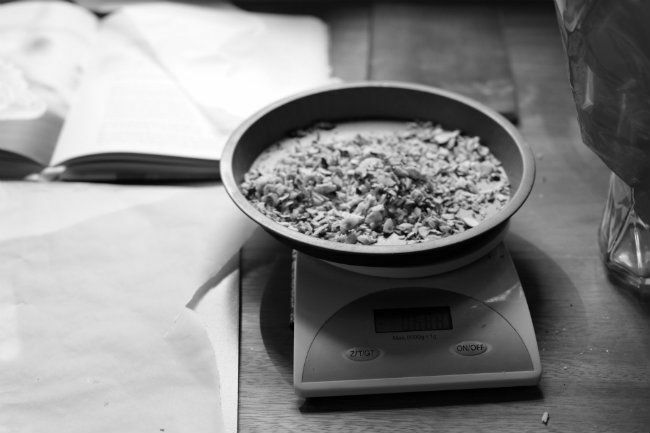 Get out a big mixing bowl and add the oats, pecan halves, sugar, sunflower seeds, coconut, cinnamon, 1/2 tsp sea salt and nutmeg (I put the bowl on my scales and zero as I add each one). Stir together. Add the honey and olive oil and stir well. Tip out onto a big baking sheet (with some sort of side) and spread out. Put into the oven and bake for 10 minutes then stir (don't worry about how gloopy it looks) and put back in for another 15 minutes. Add the cranberries, apricots and raisins and stir in. 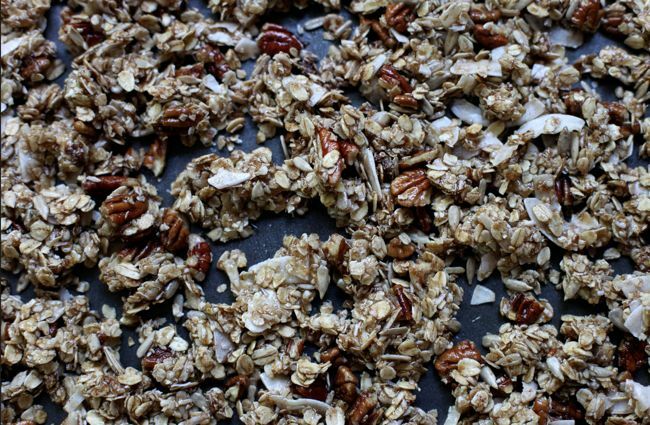 Put back in the oven for another 5-10 minutes until the granola is a rich golden brown. Stir occasionally as it cools, breaking into small clumps if needed and scraping the bottom. Add the extra salt if you think it needs it. Keeps well in a sealed box or tin (mine has always run out in under a week). 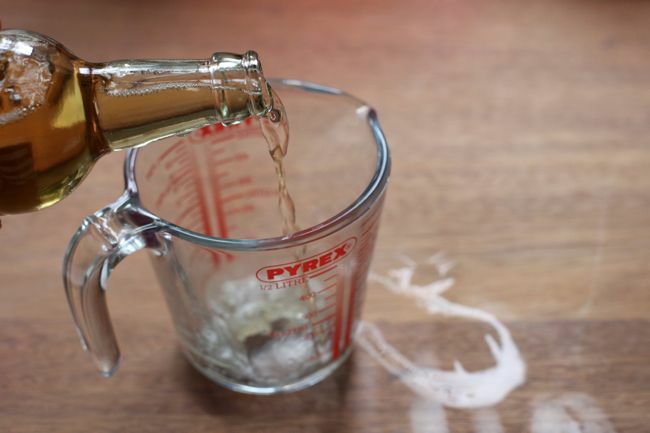 Tip: I pour the oil into my measuring jug first, then tip it around a bit so the sides are oily. Then pour in the honey up to the 170ml mark. It'll slip easily out into the bowl without the honey sticking. * UPDATE 2014 - I now use 20g instead of 40g sugar - it's a touch less sweet and the flavours seem more pronounced. I mix and match the add-ins (i.e. nuts, seeds and fruits) according to my cupboard that day - dried cherries and chunkily chopped skin-on whole almonds are some of my new favourites. I also switch between honey and maple syrup - you can use the same volume. I left a detail out of my last post: the moment I made my decision. I was sitting in bed, late at night, exhausted but sleepless. I had been turning the question over in my mind for days, again and again, the choices tumbling about on an uncontrollable spin cycle. In the midst of it all, I was feeling guilty about how little I was achieving and how many things were lingering on my to-do list. To try and calm my mind so I could sleep, I picked up a book that I'd bought on impulse after reading a quote on a post. Apparently it's famous in the US but I hadn't heard of it before. The book was Letters to a Young Poet by Rainer Maria Rilke, translated from German. "Nobody can advise you and help you, nobody. There is only one way. Go into yourself. Examine the reason that bids you to write; check whether it reaches its roots into the deepest region of your heart, admit to yourself whether you should die if it should be denied to you to write. This above all: ask yourself in your night's quietest hour: must I write?" As I read that first letter, I realised two things. First, I must write. 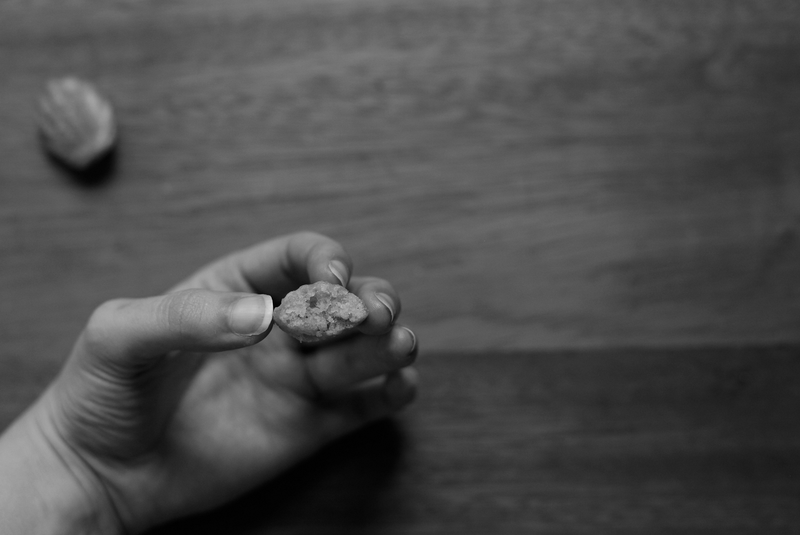 Academic essays, this blog, whatever comes to mind - but I could never truly let it go. I don't think I'd realised that before. Silly as it may sound, I hadn't noticed that writing was important to me (though, to be fair, I don't know that I'd go as far as dying). I also knew that the desire for the book didn't run deep enough. I could imagine giving it up. I was actually excited about the alternative. And so that was the moment that I realised I couldn't take it on and knew, from my "innermost instinct", which path I would pick. I find it funny - and so typical of the winding ways of life - that this experience would reveal through not writing that I want to write - in some form. It's not about being published or having others read it or being good or bad. It's just about putting words on a page. 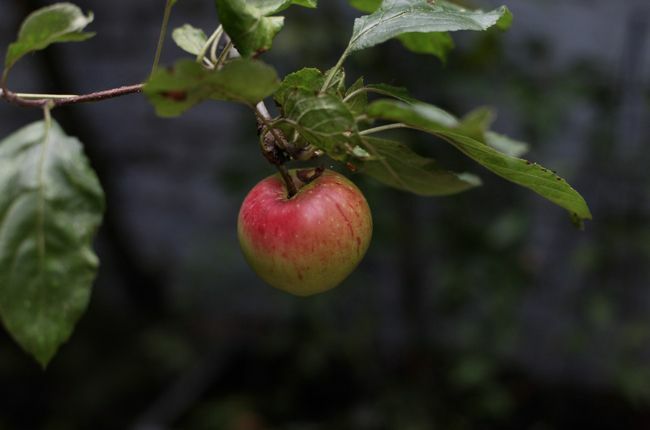 In my tiny garden in Oxford, there is an apple tree. I noticed it when I first looked round. It was spring and the tree was full of blossom. I grew up around orchards and it made the house feel like home. 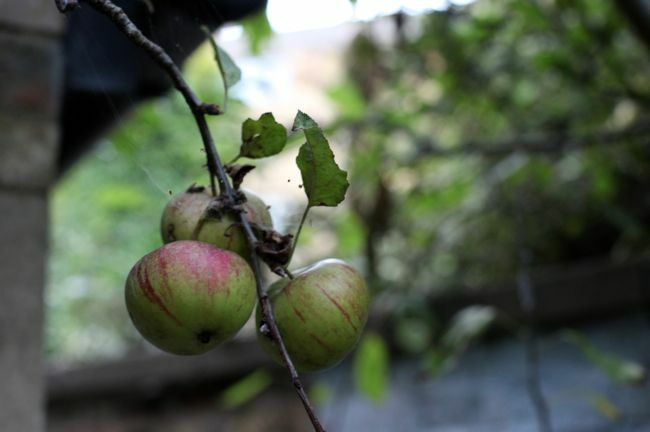 In the months since, I've watched the flowers turn to tiny apples, then grow and grow. In the past few days they've started blushing. Every morning I wake up to a little more colour glowing through the window as I make my first cup of tea. 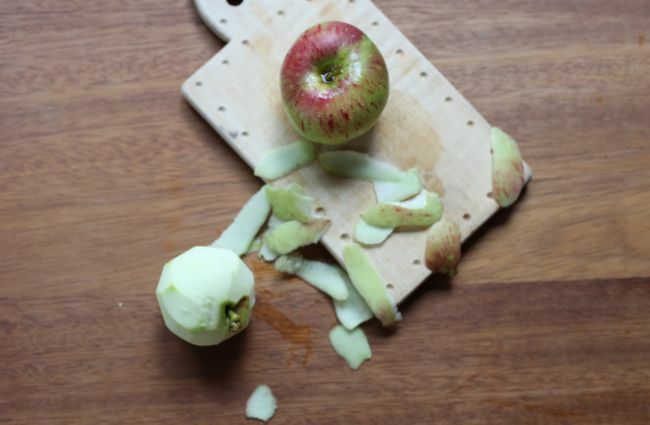 On Thursday, I posted a photo of some of my apples on facebook and twitter, asking what everyone thought I was making and what they would make. Nobody guessed this recipe, but there were so many tempting suggestions: apple pies, crumbles, fritters, tarts, baked apples, strudel, cake, cider and several mentions of tarte tatin. I've touched on a few before - among other things, apple & quince pie, spiced apple cake, my childhood favourite tarte aux pommes, ginger and apple jam, crumbled apples, brown sugar & pecan baked apples and toffee apples. I'm sure this harvest will inspire more apple-based posts. The answer nobody guessed was sautéed apples. I think sautéed is the right term, though maybe the heat isn't high enough. The slices of apple are fried in a small amount of butter until tender and starting to caramelise. Fried sounded odd in the title and I couldn't think of a better word, so sautéed won. 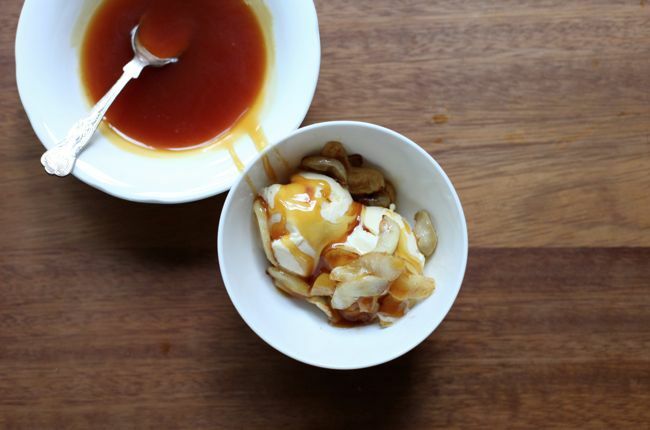 The cider caramel was inspired by Hannah of Honey & Jam - she made a cider caramel with brown sugar for an apple pie. 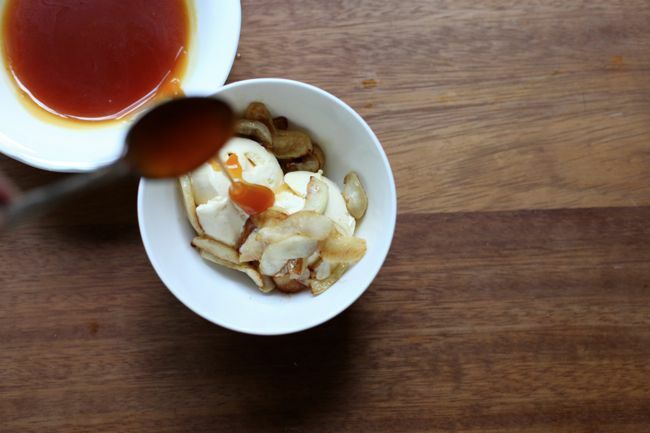 I thought I'd use my favourite dry caramel method to make a simple sauce with some reduced cider. It's hard to describe the flavour. It's sort of tangy, slightly sharp and yet sweet and smoky. I've been resisting posting this cinnamon ice cream recipe for ages - I've made it lots of times but I feel that I've adapted enough of David Lebovitz's The Perfect Scoop recipes now. So, as I did for the Crêpes Suzette post, I'm going to suggest that you buy the book - even just for this recipe. If I could only keep three cookery books, it would be one. The ice cream is made with lots of whole cinnamon sticks that are crushed and infused into the dairy - the flavour is quite different from ground cinnamon and really lovely. 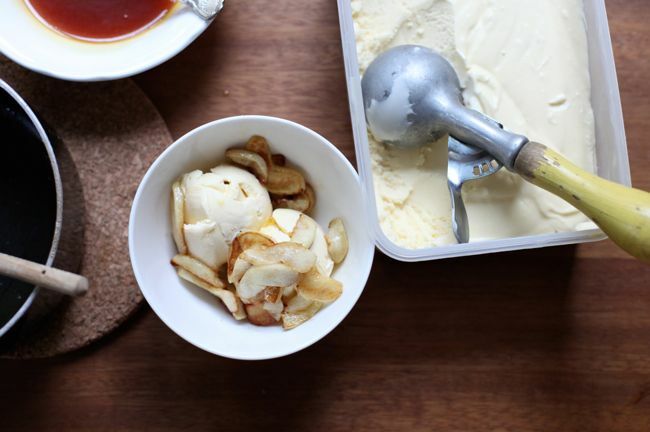 If you don't fancy making the ice cream, you could add a little cinnamon to the apples as they cook and serve them with the caramel over some good vanilla ice cream. Put together, the bowl is very rich but deeply gorgeous. Another time I think I'll do one scoop of ice cream per person. 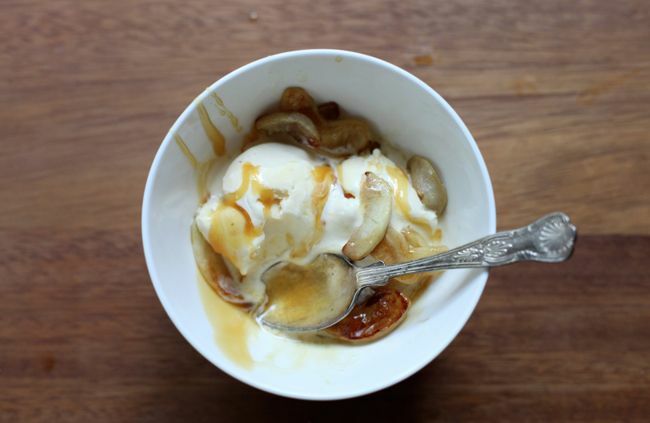 There's a pleasing temperature contrast between the hot apples, warm caramel and ice cream. It's comforting but a little bit different. Finally, I'm excited about blogging again. I hope that the tone will lighten now that things are a little less complicated - I know I can get a bit too earnest and serious at times. Pour the cider into a small saucepan and bring to a boil. Keep going until the cider has reduced by half to 75ml - I kept the measuring jug nearby and poured it in and out occasionally to check the volume. Tip the sugar into a heavy bottomed pan and shake it into an even layer. Place over a medium heat. The sugar will take a few minutes to start melting, but don't go far. Don't stir the sugar - you can move/flick the unmelted sugar with a spatula into the patches that have melted. Get a whisk ready and have the butter and cider nearby. Once it has all fully melted, keep heating until it reaches a copper colour - it often gets quite a bit of colour while it melts, so it shouldn't take long. The moment you're happy with the colour, turn the heat off and whisk in the cider, then add the butter. Keep going until all the lumps have disappeared and the butter has melted. Whisk in the salt. Transfer to a bowl to cool a little. It will thicken as it cools - heat back up by warming the bowl in some hot water. Keeps in the fridge for a few days. Peel and core the apples then slice them into thin slices. Place them in a saucepan or frying pan so that they can lie in one layer (or nearly do so). Add the butter and sugar and stir together as the butter melts. Cook, stirring occasionally, until the pieces yield softly to a knife. They might start caramelising a little, especially around the edges - this is a lovely bonus, so don't worry. On Thursday, I had to make a choice: sign the contracts for my Oxford place and run into town to meet the deadline, or wait and see if an offer would come through on my book proposal. I've written thousands of words in the past few weeks, trying to clarify the decision I had to make. This is the third day I've sat here, sifting though and trying to form this post. What do I say? I chose university. It was always a case of two wonderful opportunities battling it out. I never stopped wanting to do my course. The timing wasn't right for the book - it never worked (or flowed, as my hippy mini-me would have said). An offer had been predicted to arrive a few days before the deadline but missed it. The true death blow was that my enthusiasm and faith in the idea had slowly seeped away. I couldn't start such a huge and difficult project without the belief that it was worth writing and that I would be proud at the end, whatever offer had turned up. I also chose to concentrate on this blog. This means that I don't have to save recipes or ideas for the book - I can give you all of them, immediately, free and as I imagined. This isn't just a stepping stone or a platform formed of numbers and statistics. I'm proud to say that I'm a blogger. In a lot of ways, I've already made this decision before. In the spring, I decided that I didn't want to work in a professional kitchen, left Cordon Bleu and accepted the offer for the course I'm starting in a few weeks. Food doesn't seem to translate into work particularly well for me. I was tempted back to the flame and here I am again, slightly singed. Because of this, I've had to make a few more choices. First, I'm taking a break. When I decided to do this masters, I wanted to spend the summer reading and doing language work in preparation. The proposal has swallowed a whole season and now I have a few precious weeks to wake up my academic brain and enjoy my reading lists. So I'm going to leave for a bit, probably somewhere between two to six weeks. I've promised myself I'll be back by the 14th October at the latest and I'll still pop up on twitter every now and again. I haven't managed to work out scheduled or guest posts so I'm afraid there will be a period of silence. I have also, very sadly, had to cancel the Teas. When I announced them I thought that I would be nearly ready for both the MSt and the Teas by now, whatever happened. But yesterday I still needed to do most of the recipe testing, buy all the plates, cutlery, teapots, flowers, make the menus, organise pretty takeaway boxes, organise organise organise - and that's without the actual food preparation or cleaning the house just days before I start the course. Everyone has been fully refunded and if I do decide to try again, they will get first refusal of the places. I want to feel that pull, to really want to come here and photograph and cook and write. It's been lost in the past few months of book chaos and I can see it in every post. Yet even in the days since my decision was cemented, the desire to come back has started to creep back in, slowly but surely. I hope you'll forgive me. For this break, for cancelling the teas, for not giving you a book. 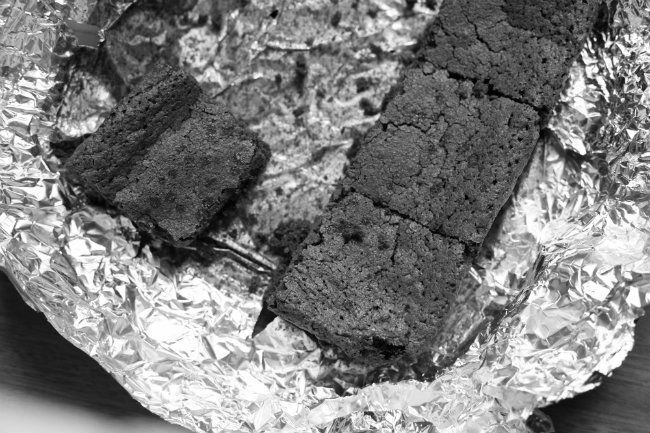 These brownies were made to satisfy a craving: simple, unadorned with nuts or extra chocolate. They improve each day - on the first night, I didn't think they were anything special. Now I think they're just right. Preheat the oven to 180C/350F. Chop the butter into slices and place into a medium sized saucepan or frying pan. Place over a medium heat and melt. Keep heating as it bubbles, sizzles, foams and turns into brown butter. If you haven't made brown butter before or want more tips, try my step-by-step Foundations post. Pour straight into a mixing bowl. Leave to cool for a moment while you chop the chocolate into small pieces. Once the butter has cooled a little (it will burn the chocolate if it's still very hot), tip the chocolate in and stir until it has melted. Lightly beat the eggs together in a small bowl. 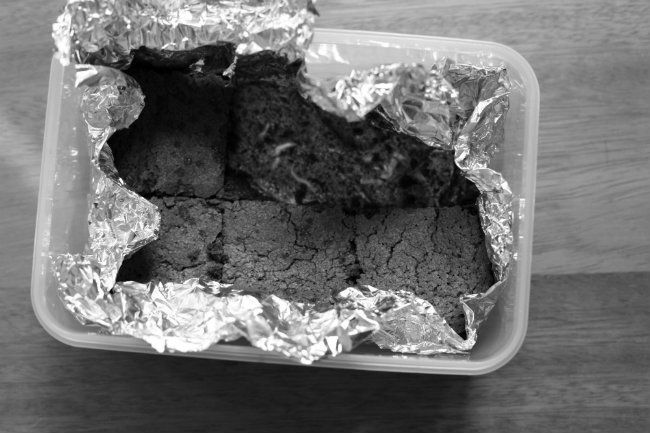 Line a small tray (a square 8", or 7" by 11" tin or similar) with some foil or baking parchment. Weigh the brown sugar, caster sugar, flour and baking powder into a bowl. The brown butter-chocolate mixture should have cooled a little more by now, so whisk in the beaten eggs, followed by the dry ingredients. Keep whisking until everything is fully combined and very smooth. Pour into the prepared tin and sprinkle with the fleur de sel. Bake for 25-30 minutes - it will haven risen before falling, so expect slightly raised crispy edges. The middle should be set. Leave to cool on a wire rack for five minutes then remove from the tin and slice. I think they taste best after two days, if you can resist that long! *I used some of a bar of this that found its way into my suitcase on the way back from California. I have seen unsweetened chocolate in quite a few UK supermarkets.